The enchiladas are a summary of some very interesting elements that live in the Mexican cuisine : tortillas, salsa and imagination. In the enchiladas dish the salsa is in charge of covering the tortillas also the tortillas are in charged of wrapping the imagination of the Mexican cook since the enchiladas can be filled with diverse ingredients. In this recipe the Mexican imagination gets too far since cottage cheese accompanied of other ingredients is used to fill the enchiladas. As final touch the enchiladas are garnished with many ingredients so they will have more flavor. This main course can be served plain or it can be served accompanied of refried beans and tortilla chips. Preparing the enchiladas is laborious and a bit complicated therefore follow carefully the procedure so the enchiladas will come out delicious. Don’t use olive oil in this recipe because it is not good for frying the tortillas. The salsa that is used in the enchiladas is made with 2 serrano peppers. If you consider that it will be too spicy for you, use less. You can prepare the corn tortillas that are used in the enchiladas and they will have much more freshness. The preparation time is of 25 minutes . 2 Coriander sprigs (.7 oz). When the salsa boils reduce to medium heat and cook it for about 4 minutes, until it thickens a little and acquires a more intense color; stir occasionally. Then set aside. Cut 2 avocados into strips, then reserve. Finely chop 1/4 of an onion (1.2 oz) and 3 coriander sprigs (1 oz); then set aside. 17.6 oz of Cottage Cheese. Take with the tongs one of the fried tortillas (that was put on paper towels) and dip it in the green salsa that was heated. Put on a large plate the fried tortilla with salsa and put over the tortilla some of the cottage cheese that was prepared. The strips of the Avocados that were cut. Recommendation: If you want your enchiladas to have more freshness put over them some lettuce strips. 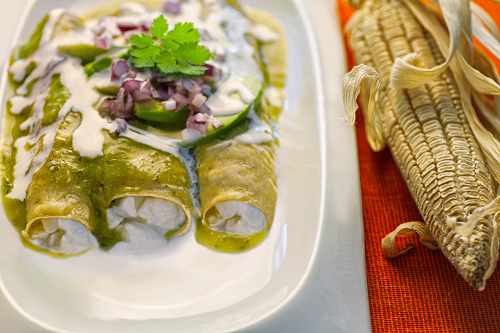 Variation: Would you like to taste the enchiladas with chicken and with red salsa. In the cuisine it is very important to know exactly the ingredients weight so the recipe comes out perfect and you can accomplish this with the “EatSmart Precision Pro". Know to perfection the temperature of the food that you cook with the “CDN Thermometer". This is a very practical thermometer that fits in your pocket, it gives the temperature in 6 to 8 seconds and it is capable of measuring a large range of temperatures.